Welcome to Eskaya Beach Resort & Spa: An invitation for a truly unforgettable, lasting memory combining the very best of luxury and serenity. A short ride from Tagbilaran Airport, discover a paradise hideaway where luxurious seclusion meets exotic natural beauty. This verdant, beach-fringed island offers sophisticated pleasures on land and water - from genuine Filipino therapies in the spa to splashing, sailing or diving in the jewel-like Mindanao Sea and Bohol's most pristine lagoon. The Eskaya Beach Resort & Spa. This stunning resort on the island of Panglao combines the scenic qualities and escapist nature of Bohol facing the Mindanao Sea with the high standards and myriad facilities synonymous with Filipino hospitality. Yet whilst it features almost 15 single-detached luxury villas, their varying locations along the beach front mean tranquillity and privacy can still be readily attained. The name Eskaya refers to the only known indigenous people of Bohol. The resort is situated right in the middle of Panglao Island which is at the southernmost tip of Bohol. It is located halfway through Panglao along its coast with commanding views of the magnificent Mindanao Sea. Designed to reflect Bohol's indigenous culture, Eskaya Beach Resort and Spa is a beautiful, rustic island resort that benefits from a strongly defined sense of community and a relaxed, intimate atmosphere. Awash with Bougainvillea, Bird of Paradise and other native blossoms, this luxurious private island resort has an exotic village-like feel, making it perfect for families and couples for whom a social environment is an important part of the holiday experience. On the accommodation front, there are beautifully-appointed villas or Balai with outdoor showers and whirlpools, as well as an enticing collection of pool villas and suites with breathtaking views into the sea. The design of the 15 Balais of Eskaya draws on the traditions of generations of craftsmen, with a generous use of timber and thatch; the result is a refined natural look that complements the surrounding nature, viewed through floor to ceiling windows. Satellite TVs, DVD players, mini-bars and generous patios are standard throughout. And when it comes to dining, anything from Asian dishes, Italian specialties and native fare are on offer at the main restaurant, massage under the stars, and the in-villa spa service designed for those seeking a little more privacy. At its hub lies an infinity pool, so big and inviting that if it were not for the swim-up bar, one could almost imagine it was created by nature. Its sun deck and adjacent beaches are the most popular venues for relaxation, although the water sports center, PADI dive school and various island-hopping adventures ensure there is plenty of daytime diversity. Eskaya, a vibrant garden island resort, favored for its intimacy and rustic luxury, is poised to become another legendary 100% Filipino-owned resort with unrivaled, intuitive Filipino hospitality and service. The unstinting dedication of its staff will continue to create magical moments to make your stay truly unforgettable. So come and escape with us. Truly memorable, truly Eskaya. If your arrival is early in the day and you prefer immediate access to your room, we recommend reserving for the prior night to guarantee immediate access. Similarly, for late departures, reserving an additional night will guarantee access until you leave the Resort. If you choose not to reserve, we will be glad to store your bags at the Front Office and make our common area facilities available for you to freshen up. A guaranteed reservation assures you of a room even if you check in late (after 6:00 pm). If a room is not available, we will arrange your accommodation in another hotel at our expense, and provide transportation to and from Eskaya as reasonable. All reservations made must be guaranteed to a major credit card. Certain arrival dates and rates may require a deposit. Please check for full deposit requirements at time of booking. Cancellations for a room reservation must be received 45 days prior to the expected day of arrival, and may differ by arrival date and room type. If cancellation of a guaranteed reservation is not received by the required date, the Resort will charge for accommodation based on the expected date of arrival and room type. For details of cancellation policies and deposit requirements, please check at time of booking. The following cards are accepted: American Express, JCB, MasterCard, Visa. The name Eskaya refers to the only known indigenous people of Bohol. 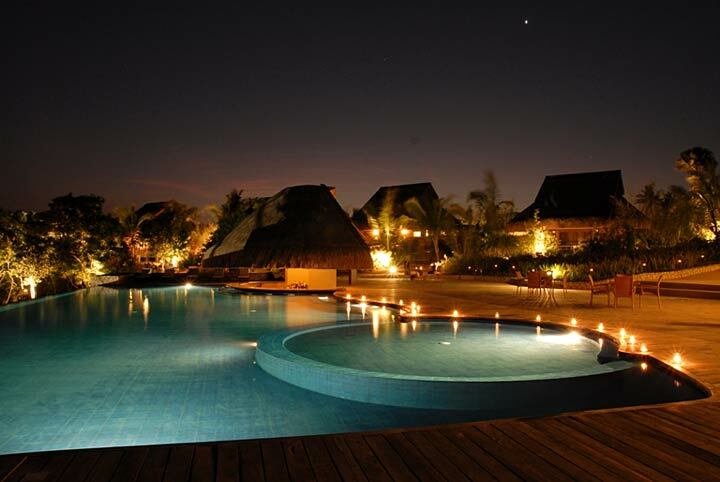 The resort is located halfway through Panglao Island, and is situated at the southernmost tip of Bohol. The sprawling property covers approximately 16 hectares. Topography is varied. The area has a gradually ascending cliff, flat land, a ravine, caves and has commanding views of both sea and mountain. The beach is a long stretch of white, powdery sand totaling up to five kilometers in length, 600 meters of which belongs to Eskaya Beach Resort & Spa. The resort is exclusively boutique-style. The architectural concept is decidedly Filipino with a touch of modernism. The thatched villas or "balai" are single-detached and built with sturdy construction materials indigenous to Bohol such as bamboo, cogon and wood. An infinity pool lies at the center of the resort, complemented with breathtaking views of the Mindanao Sea. The spacious Lantawan Restaurant gives guests a feeling of genuine Filipino warmth and hospitality serving delicious international cuisine throughout the day. Dining can also be set up at the beach, bonfire-style, or al fresco by the poolside or at the garden. A variety of sports activities is available such as volleyball, badminton, table tennis and water sports like jet ski, snorkeling, etc. In-room spa services are available upon request. Guests have the option to visit some of Bohol's natural wonders such as the famous Chocolate Hills, Loboc River Cruise, a man-made forest trek, or visit an endangered species called the Tarsier. They can also go island-hopping, scuba diving at Balicasag Island, whale-watching at Pamilacan Island or if you are lucky, get a chance encounter with dolphins. All these can be arranged at the resort upon arrival. Beachfront at Eskaya Beach Resort. Each villa boasts a luxurious whirlpool good for two persons with an indoor garden setting while the Pool Villas have their own private pool amenity with its own landscaped garden. The Family Villa have two bedrooms each and a living room with a whirlpool good for four persons, while the luxurious Presidential Villa has a colonial tub plus an outdoor spa. All villas feature either king or twin beds, high thread count sheets, spacious outdoor bathroom with vanity, a complete array of bathroom amenities and towels, mini-bar, coffee and tea making facilities, safety deposit box, hair dryer, a compendium, IDD telephone access with two extensions, flat screen television with cable, DVD player and iPod speaker. All pool villas have LCD screens. 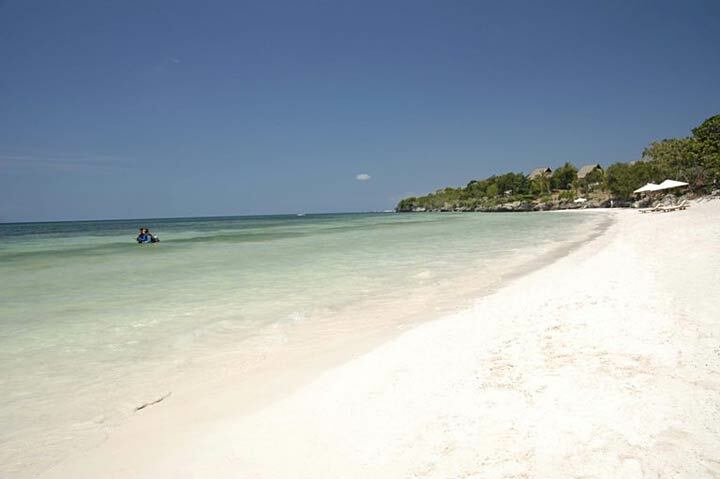 Panglao Island is shielded from the harsh effects of tropical cyclones by mainland Bohol and the neighboring islands of Cebu, Mindanao and Siquijor. As in most parts of Bohol, the climate is tropical without too much variations. The best period to stay is from November to February, when the climate is slightly cooler. Summer time is from March to May, while heavy rains are expected from June to November. Lightweight clothes made from cotton and linen is highly recommended. Both English and Filipino (tagalog) are widely spoken while Visayan is the local dialect. The content of this inquiry form will directly be forwarded to Eskaya Beach Resort & Spa by email. Please allow a few days for a response.